Police arrested a 31-year-old E-6 on Sunday night in Chula Vista, Calif., after he allegedly punctuated an argument over cab fare by denting the hood of a taxi with an Australian musical instrument. A cab driver told San Diego’s 10News that he picked up Naval Aircrewman (Helicopter) 1st Class (NAC/AW) Joaquin Gonzalez and his female companion at a Mission Valley bar shortly after the San Diego Chargers-Denver Broncos game and drove them to Chula Vista — a $60 cab fare. Gonzalez and the woman both fell asleep, the cabbie said. When they woke up, they reportedly attempted to leave without paying the fare. That allegedly led to an argument. Gonzalez then allegedly left the cab and, according to what police told U-T San Diego, things allegedly got weird. 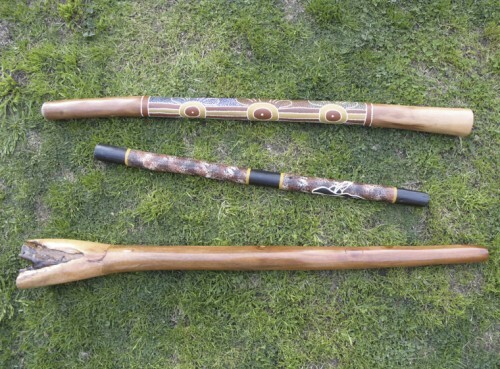 He allegedly returned to the taxi wielding a didgeridoo, a wind instrument native to Australia, according to the established Internet authority on such matters. Gonzalez allegedly dented the cab with the instrument and reportedly chased it down the street; police responded to reports of a man wielding a bat running after a taxi and arrested Gonzalez, charging him with felony vandalism. Gonzalez is assigned to the “Wildcards” of Helicopter Sea Combat Squadron 23 at Naval Air Station North Island, according to Navy personnel records. His awards and decorations include a Good Conduct Medal. He’s out on bail, the U-T reported. Video from the 10News report is below. The entire cab is not worth $5000. They get bought surplus for less than $3000.